The Scorpion Bar at El Sol Mexican Cantina spills out onto the pavement on the Kingsway. El Sol is the kind of knowingly scuffed space that demands you kick off your shoes, order a cerveza and recall the time you lived a barefoot existence in a palapa on a beach in Mexico, cooking fresh tortillas and frijoles over an open fire and practising your Spanglish. At least that's what The Husband and I do when we visit El Sol. 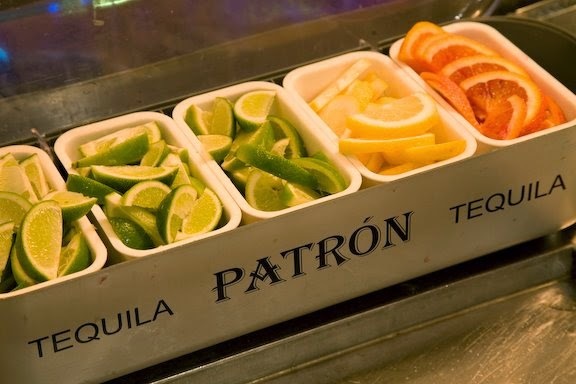 Did someone say it's tequila time? The drinks list at El Sol is extensive and impressive. We rewound to when we spent a total of nine months in Mexico, with two-thirds of that time living on an isolated beach in Michoacan and cooking around a bonfire under a sky pricked with stars. To say we are fond of the North American country, its food, people and culture, is a rank understatement; it remains one of our favourite places on the planet. Aye carumba! El Sol Mexican Cantina is loud and lively. Day of the Dead-esque decor. 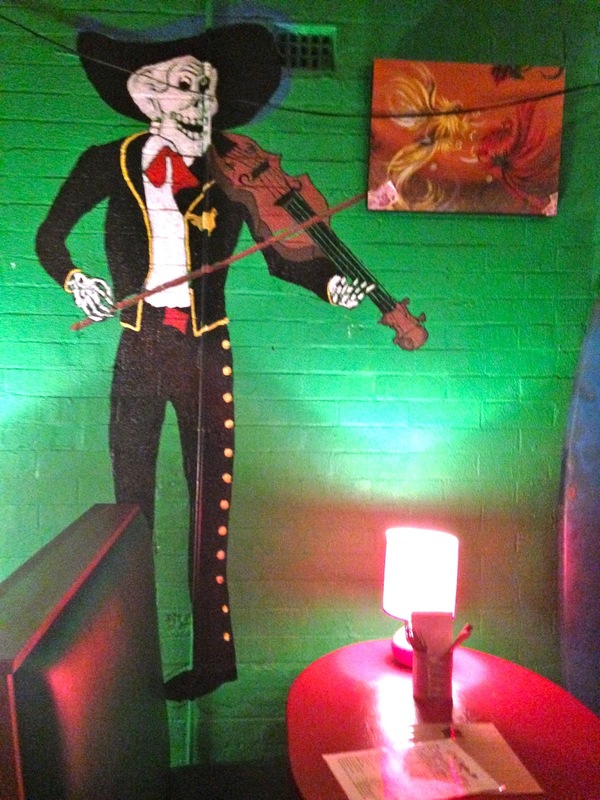 It's no wonder we feel so warm and fuzzy when we enter the Cronulla cantina, which is a riot of colour from swatches of velvety fabric, skulls, skeletons, jugs of sangria, statues of Jesus, nuclear-red walls and a range of ridiculously hot sauces. It's got that anything-can-happen-and-it-probably-will vibe down-pat. That's Mexico en pocas palabras (in a nutshell). Mexico is chaotic and loud and a little bit loose and El Sol is a microcosm of that, minus the moustachioed men in sombreros packing heat. First impressions are muy bueno: the staff are young and welcoming, the chef slings out really satisfying and serviceable food, the bartender rightly recommends a bucket of five Mexican beers for $30 and the place has found an audience that appreciates all of the above. With most starters on the menu at around the $10 mark and mains ranging from $15 to $30, the pricing is keen. Co-owners Jad Nakhle, Dean Hughes and Geoff Trio bought the business about six years ago and have cultivated a dedicated loyal following ever since. Jugs of sangria, all-you-can-eat tacos, buckets of beer and live bands make El Sol a Sunday stalwart. 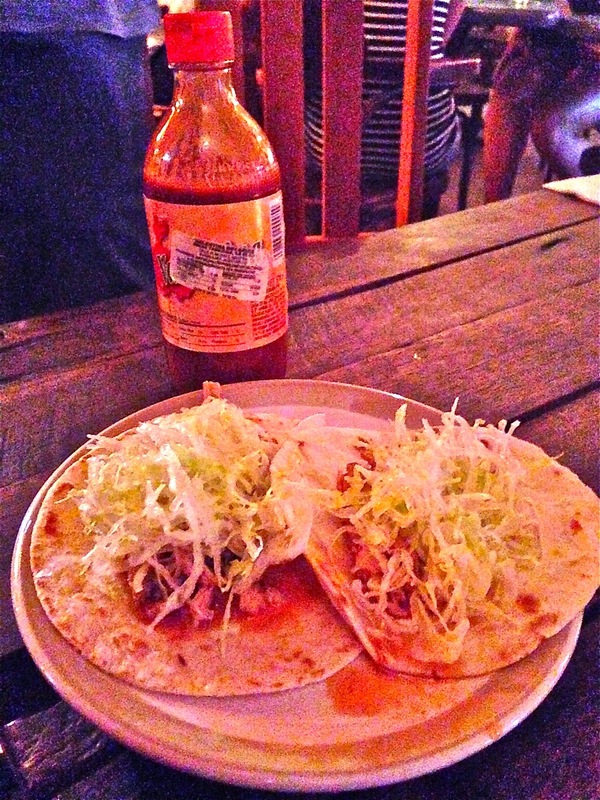 All-you-can-eat tacos for $15 is a sweet deal. Make no mistake, the food here is no-frills hawker-style food. But that's what Mexican food is. On Sundays, the all-you-can-eat taco bar ($15 for adults; $10 for kids) is a DIY affair. My two sons, who surfed for a total of five hours on the day we visited, devoured nachos ($11) with slow-braised shredded beef with black beans, cheese, salsa and sour cream followed by eight soft-shell tortillas each, which they filled with beef, salsa, queso and lettuce. The fact that the tortillas are pillowy soft and the salsa is perfectly piquant just adds to the joy. And seriously, at $1.25 a pop, it's a very wallet-friendly proposition. Warm chicken salad was much more appealing than it sounded, with hunks of marinated chicken still warm over a mound of shredded purple cabbage, capsicum, spring onion and coriander. Note the newly launched bar menu also features street cart faves such as elotes callajeros (grilled corn) and chilli con queso (four-cheese-dip with jalapeno chillies). There is a lot to love about El Sol thanks to co-owner Jad Nakhle (pictured), Dean Hughes and Geoff Trio. Like Yalla Sawa and the Brass Monkey, this is a family affair with Jad and wife Hayley's Argentinian brother-in-law head chef Francisco Desrets the Latin American connection in the kitchen. 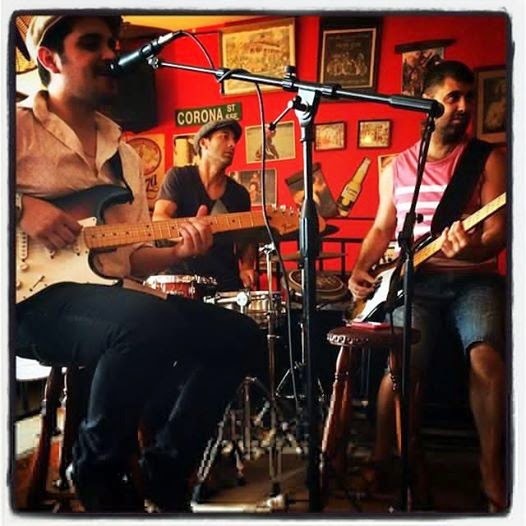 As co-owner of the Brass Monkey, one of Sydney's best live venues, Jad's music industry connections make live music even more accessible for all with a Sunday jam session at El Sol led by Terepai Richmond a real weekend highlight. The fact there is no cover charge for such top-notch shows is another reason to support El Sol. To give you an idea about the calibre of the acts here, on the Sunday we visited, US singer John Mayer's guitarist David Ryan Harris was in the spotlight. I repeat: there was no cover charge. The session musicians that join drummer Terepai Richmond on stage each week are some of Australia's finest funky allstars. Terepai is one of Australia's most sought-after session musicians - he joined the Whitlams in 1999 - and he curates little variations to the lineup each week. As well as the improvisational jams, the colourful cantina celebrates music that is live and loud on Friday and Saturday nights and features the odd surf film and soccer match, too. Let the good times roll at El Sol. El Sol has two bars and while it hosts the occasional touring band, it's the local bands that get the largest draw. The Scorpion Bar is just a few steps above the main floor and spills out onto the Kingsway, while the Cantina Bar is one of the most comfortable places for all ages to sit and watch the show. El Sol is buzzy and buzzy and a popular hangout for local musicians and hospo peeps. In summary, this come-as-you-are cantina has a dark and divey ambience, is unpretentious and comfortable and boasts a menu that pairs perfectly with a cold cerveza or cocktail and a stellar lineup of local acts. Once the sun has slipped over the sea, the space really cranks and the good times roll until about midnight. It's one of the best down and dirty bars in Sydney and, even better, it's just around the corner from me in Cronulla. El Sol, Shop 2 40-42 The Kingsway, Cronulla Beach, + 61 2 9544 4116, Open Tuesday-Sunday 6pm-12pm Tues-Thurs, 6pm-midnight Fri-Sat, 3pm-11pm Sunday. El Sol has heart and soul and is a cantina a Mexican would be proud of. 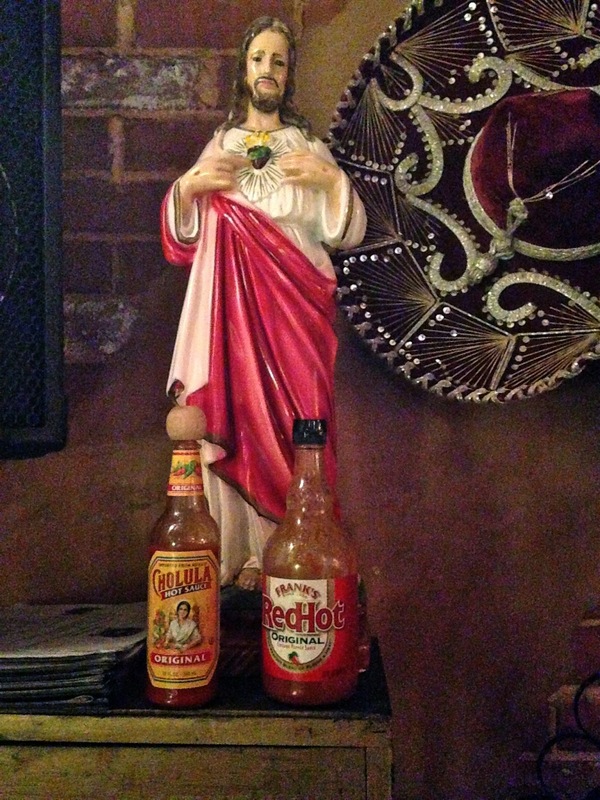 Worship at the altar of hot sauce.